This entry was posted in Publishing, Writing and tagged effective marketing, self publishing, time wasters for writers, traditional publishing, Writer's Digest, Writing time vs. marketing time by Helga Bolleter. Bookmark the permalink. Thanks, and welcome to the site all the way from Australia! My biggest problem is forging a cohesive, compelling plot. I will copy this article, blow it up and pin it to my wall. Thank you. Janet, we are sharing the same challenge, as do most writers. Best of luck finding a plot that works for you. Thanks for your comment. Andrea, for the reasons you outlined in your comment, more and more writers realize this. Taking the self-publishing route is a way around it, for better or worse. Great to hear about your success with short stories! Thanks for stopping by. Hmm, I started my fourth novel just over a year ago. I have not worked on it for nine months. In the meantime I have published my third novel. This has involved an awful lot of writing (apart from the hundredth revision) to do with marketing, blurb, press releases, Advance Information sheets, endless semi-related blog posts etc. The novel was published in December and I am now at least writing again, but on my non-fiction manuscript (Far East POWs needing much research), but I am also the whole distribution office behind my last novel, so self-publishing takes vast quantities of time. You’ve got to love writing, full stop. Love the plot structures. got to love writing. Congrats for publishing your third novel (it’s ‘Borderline’ I assume? ), and all the best for your non-fiction work. Sounds like a worthwhile project. Thanks for stopping by! In conjunction with my blogging hiatus to focus on writing, I’m purposely not thinking about the publishing/marketing end of the equation. I think it’s too easy for writers (especially those who are unpublished or new) to get caught up in what should be the end game before they’ve reached a good level of writing and storytelling. JM, spoken from the heart! And I could not agree more, though others may differ. Or not. Who knows? Either way, time waster No. 5 above states the blindingly obvious: Focusing on publishing when you should be writing. What’s the point of becoming experts in publishing when we have nothing to market. The priority has to be writing above all else. Period. Full stop. Oh, so true! Gone are the days when the traditional presses would handle all of the publicity and marketing chores for an author. Today, the work load and responsibilities aren’t that different for a traditionally published author and an independent one. That’s a major factor in so many writers choosing to go indie, and I certainly understand it. Why let a press keep so much of the profit when it makes the writer do work the company used to cover? 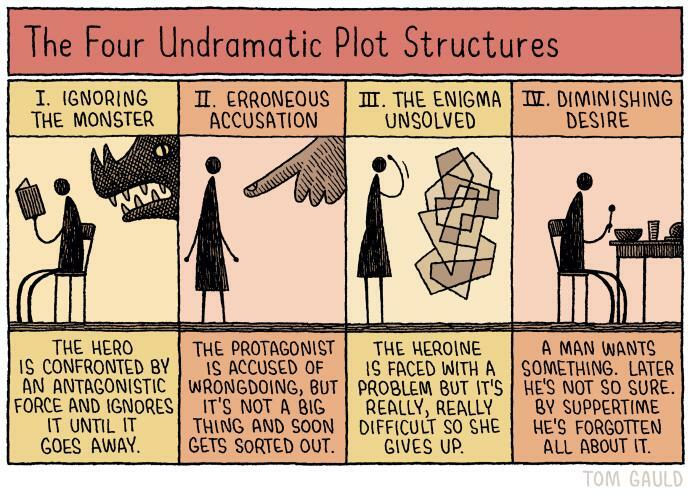 Helga, I don’t know where you came across the “4 Undramatic Plot Structures”, but it’s brilliant! I laughed until my stomach hurt. You bring up such great points in this thoughtful post — it really gets to the heart of the matter. You’ve crystallized the thoughts of many “emerging” writers, myself included, as we wrestle with our waxing and waning confidence and enthusiasm. It’s like having (instead of a devil and an angel) a cheerleader on one shoulder and a naysayer on the other, both whispering in our ears. In the end, it’s our own creative urge that drives us — and that spark needs to be constantly fed. Mine likes Godiva chocolates. Thanks, Silk. That’s precisely our conundrum. Which creature has the louder voice? Cheerleader or Naysayer? It really does come down to how much confidence and drive the writer in us can muster, not to mention how many plates we can spin in the air at any point of our career. Great comment! Helga, Helga, Helga! How did I miss this blog post!! Just read it now, over six weeks late. Oh wait, I know now! This came out the weekend I picked up the incredible Ms. LuLu and drove my new 8-week-old (now 14-week-old) puppy 2500 kilometers through 3 states while watching the Australian Open and the Super Bowl and eating take out pizza and putting the puppy in hotel bathtubs to pee. But damn, girl! That’s a great post! I can identify with this. I’m currently trying the route of a Kindle Scout campaign for my third novel. The first novel I sent out some queries on, and of course I quickly became depressed by the easy rejection. As any other authors who have tried the traditional publishing route know, agents don’t even read your manuscript before rejecting it. And really, it’s understandable. Who would have that kind of time? If you join any author communities (like the young adult Figment for example) you’ll see there is tons of work out there that isn’t worth the ink with which its been printed. It’s frustrating that good authors, with moving characters, and strong plots fall to the wayside while celebs like Kim Kardashian can make millions on a book of selfies. I’ll also be writing a blog post about the topic if you want to know more. I love your title ‘Die by Night’ (a wolf will do anything for his mate). And I totally agree about your comment re good author falling to the wayside while Kim K’s book of selfies makes millions! Thanks for commenting, and I would love to read that blog post you mentioned. Send me the link please. Hopefully that’ll be up in a few days. I’m waiting on those antibiotics to kick in! Reblogged this on Nu Ah Blog.